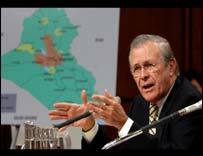 US Defence Secretary Donald Rumsfeld has admitted that the US had no fresh intelligence about weapons of mass destruction in Iraq before going to war. It was increased worries about terrorism, not new evidence of Iraqi preparations, that was the key reason for going to war, he told the Senate Armed Services Committee. "The coalition did not act in Iraq because we had discovered dramatic new evidence of Iraq's pursuit of weapons of mass destruction. We acted because we saw the evidence in a dramatic new light - through the prism of our experience on 9/11," he said. 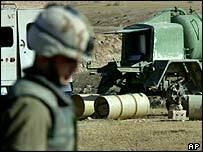 Mr Rumsfeld said that WMD would eventually be found in Iraq. He said that the terrorist attacks on the United States in September 2001 "changed our appreciation of our vulnerability - and the risks the US faces from terrorist states and terrorist networks armed with powerful weapons". One Republican Senator, James Inhofe, argued that the whole controversy over WMDs was a "diversionary tactic by the media". Mr Rumsfeld stated off in an ebullient mood as he appeared before the committee along with General Tommy Franks, who has just stood down as commander of US forces in Iraq. Republicans and Democrats alike were eager to praise General Franks for his quick and decisive victory in war, and for his new style of warfare. But the defence secretary soon faced tough questioning on the current situation in Iraq - and the justification for war. Mr Rumsfeld attempted to downplay the significance of Tuesday's admission by the White House that allegations that Iraq had tried to buy uranium from the African state of Niger were based on forged documents. He told the committee that "the fact that the facts change from time to time with respect to specifics does not surprise me or shock me at all; it is all to be expected. It is part of the intelligence world we live in." Joseph Cirincione, director of the Non-Proliferation project at the Carnegie Endowment for International Peace, said that he was "shocked" by Mr Rumsfeld's comments, and that public statements by senior Bush administration figures had repeatedly claimed that there was new, fresh evidence for WMD programmes in Iraq. He added that the failure to find any weapons was proof that the much-criticised UN inspections process had been more effective than previously believed. And former key intelligence official in the State Department, Greg Thielmann, said that the Iraqi intelligence estimates "had been misrepresented on the part of the administration", with both "misleading summaries" and "inaccurate formulations" clouding the accuracy of key public statements. Mr Thielmann, who stood down as military affairs director of the State Department's Bureau of Intelligence and Research in October, noted that his boss, Colin Powell, had not repeated the claims made by President Bush about Iraq's nuclear programme in his testimony to the UN. He said that his agency had rejected such evidence as not well-founded. He had been "surprised and then appalled" when he heard the nuclear claims had been made by Mr Bush in the State of the Union speech. Mr Thielmann also said that there was little evidence linking al-Qaeda and Iraq. Many senators had more local concerns. They wanted to know when the American troops would be coming home, and why Iraqis were still shooting at them. General Franks admitted that the US would have to maintain its current force levels, of around 145,000 soldiers, in Iraq "for the foreseeable future." Mr Rumsfeld said that the US was hoping that forces from other nations, including Britain and Poland, would replace some US divisions in the future, with up to 30,000 coalition forces in place by the autumn. 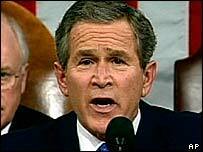 He seemed unable to answer a question by Senator Robert Byrd of West Virginia, who voted against the war, as to how much the occupation of Iraq would cost. Mr Rumsfeld's staff later said that current US operations in Iraq cost $4bn per month, or nearly $50bn per year, while Afghanistan costs nearly $1bn per month. Republican Senator John McCain urged the Bush administration to "give the American people a concrete plan" on the costs and duration of the US occupation in Iraq "even if this is a pessimistic scenario". "The White House is increasingly feeling political heat"